When you’re home, you have everything within your reach – from your makeup wipes to your cleanser, toner, serum, eye cream… you get the drift. Everything’s within control until you decide to travel. All of a sudden, your skin may feel extra oily, dehydrated or dull. Well, it should not come as a surprise. Your surroundings have changed and so will your skin! Is it going to be cold, hot, or dry? Because, yes, it’s going to make all the difference. Dry: Prepare for moisture loss and breakouts. Go for serums and lightweight moisturisers that will replenish the moisture without weighing down your skin. You can also consider bringing along a travel-size hydrating mist! Humid: Exfoliate your skin frequently and use a cleanser with salicylic acid and jojoba beads. Winter: It is common to experience drying, or even flaking, of skin during winter. Use an oil-based moisturiser, at least twice a day, that will create a protective layer on the skin to retain moisture. If you’re travelling to a climate your skin is not used to, it is advisable to prep your skin first. 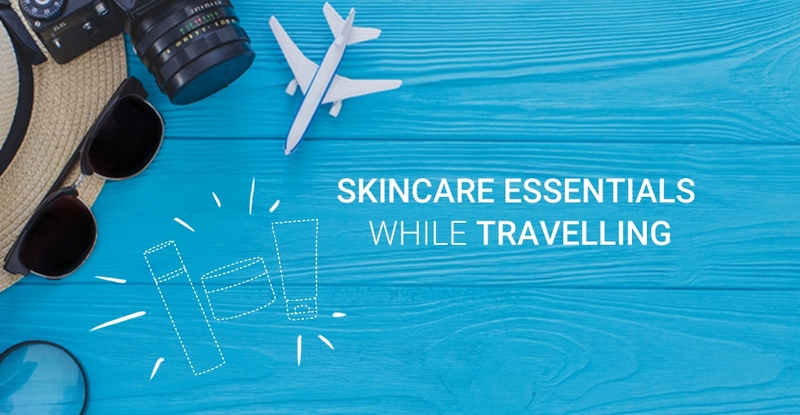 Start using your new skincare products a couple of days before departure! Your skin is going to be under a lot of stress while travelling. This means leaving your harsh cleansers and peels at home. You don’t want to use any products that may cause breakouts or irritation while you’re on vacation. You probably have to cut back on products to pack economically, so sticking to the basics would be a really good idea. Pack only a cleanser, a moisturiser and a sunscreen, your skin will thank you for it. We cannot stress this enough. Whether you’re walking through the aisles of Chatuchak or visiting the Eiffel Tower in winter, sunscreen is fundamental. Bring along a broad-spectrum sunscreen with at least SPF30! Our new in-house sunscreen: PERHAPS UV PROTECTOR! This SPF 60 PA+++ gel-based sunscreen protects your skin from both UVA & UVB rays, is not oily, not sticky and does not clog pores!